Our range of products include lamp votive candle holders. 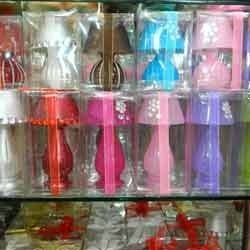 Owing to our state-of-art manufacturing unit and latest technology, we are involved in manufacturing and supplying a classy range of Lamp Votive Candle Holders. The provided candle holders are designed to suit any interior and are capable of augmenting the appearance of the room. Keeping in mind, needs from our prestigious clients, these candle holders are manufactured by our expert using high grade basic material and sophisticated techniques. We assure our clients that our offered candle holders fulfill every industry parameter of quality.